Same price as Argos now - in stock December 7th. Good for some looking for delivery as Argos dont have Gran Turismo in stock for delivery for most postcodes. I got this £299.99 deal at Argos day before yesterday and Argos forgot to mention that I had a free game with it. So went back and found that the game was out of stock, so got Assassins Creed Origins free with it instead. In fact, the manager said I could have ANY game I wanted as a replacement.....so chose that based on great reviews - Which was nice. There are better options at Game. 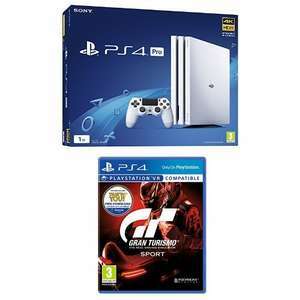 …https://www.game.co.uk/en/m/playstation-4-pro-white-1tb-with-gt-sport-singstar-now-tv-2250647https://www.game.co.uk/en/m/playstation-4-pro-white-1tb-with-gt-sport-prey-now-tv-2250649https://www.game.co.uk/en/m/playstation-4-pro-white-1tb-with-destiny-2-singstar-prey-now-tv-2250685There are better options at Game. Really? I got as far as the Pay Now button. Not hitting as I dont think this is a good deal. Amazon customer support adds to it - I would take that instead of an extra game worth a fiver anyway. You cant really beat it. I got this £299.99 deal at Argos day before yesterday and Argos forgot to …I got this £299.99 deal at Argos day before yesterday and Argos forgot to mention that I had a free game with it. So went back and found that the game was out of stock, so got Assassins Creed Origins free with it instead. In fact, the manager said I could have ANY game I wanted as a replacement.....so chose that based on great reviews - Which was nice. Good job I picked up my LG OLED557BV for £1,350 2 saturdays ago. Was delivered last Saturday and I'm looking forward to using it again this weekend. The Pro can play some games in 4K (needs a 4K TV to do this) as well as other games running better on the pro. For example Dark Souls 3 is 30FPS on the PS4 slim and targets 60FPS on the Pro. Deal posting newbie! This is Mister_Khan first deal post. Help out by leaving a posting tip or just to show your appreciation for their contribution.